The honorary degrees are awarded in acknowledgement of the distinctive contributions and achievements made by the recipients within their respective fields. The University will also be conferring two Distinguished Honorary Fellowships. Dame Carol will receive the honorary degree of Doctor of Science on 14th July. Professor of Rheumatology at University College London since 1994, Professor Dame Carol Black has been Medical Director of the Royal Free NHS Trust since 2000 and President of the Royal College of Physicians, London since 2002. 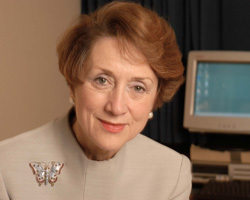 Internationally acclaimed for her research in rheumatology and connective tissue disorders, in 2002 she received a CBE for her pioneering work in systemic sclerosis, followed three years later by a DBE. The achievement of FRCP and FmedSci are two among many distinctions she has received, both within the UK and internationally. Her roots are in Leicestershire. Born in Barwell, she attended the local primary school, followed by Market Bosworth Grammar School. She worked as a Ward Orderly at the Leicester Royal Infirmary during her holidays and – with her father – was a supporter of Leicester Football Club. Educated at the University of Bristol she first read History, then medicine. During her early career she worked at the University of Bristol School of Medicine and the West Middlesex University Hospital, subsequently moving to the Royal Free NHS Trust in 1989. Professor Dame Carol Black serves on the National Specialist Advisory Group, the Appraisal Committee of NICE, and the NHS Modernisation Board. She is Vice-Chairman of the Wellcome Trust Clinical Interest Group; and a Member of the Scientific Co-ordinating Committee of the Arthritis Research Campaign. She has served on numerous national committees and is a former President of the Section of Clinical Immunology and Allergy at the Royal Society of Medicine. In 2002 she was elected President of the Royal College of Physicians. "As we celebrate the success of our students, we are always delighted to award honorary degrees to people whose contribution to their local communities, society and the world at large is indisputable. “This has been a very special year for the University- we were ranked joint first for student satisfaction in the National Student Survey amongst institutions with full-time provision and we have broken into the top 20 of the Times Good University Guide for the first time. “These are tremendous successes at a time that Leicester is investing heavily for the future- our £300m Development Plan has seen new state-of-the-art facilities come on stream providing new opportunities for advances in research and teaching excellence. Professor Laurie Taylor –Doctor of Letters- 14th July (pm), Leicester graduate. Former Professor of Sociology at York. THES columnist.